This is a water streak, holds are fairly stable but climb softly anyways. Pebbles rain down from the top of the Headwall and continue down eventually. Mostly knobs and edges in the matrix make for good holds. Stay low in the traverse to the left on the first pitch to keep the bolt above you. Use a long sling. To find route, walk south about 200yds along trail at base of Headwall til you come to alcove and shallow dihedral with a line of bolts up a waterstreak. From Echo Canyon parking lot, look along headwall to tallest portion, a guano-covered pinnacle marks the left side of the climb. Many bolts, some 1/2" x 7" with a two bolt anchor first pitch; Rap hangers on left for last pitch. Following up the first pitch of Donamatrix. I think this line is best when done as one long pitch. Then it is 16 bolts long, fun. 24" Runners on bolts 3-5, don't clip the anchors on the top of P1, and sling the first bolt on p2(you can clip this pretty much from the ledge anyways). I don't know if this is the same issue as others have said (as some of you guys said nothing is wrong), but I definitely don't feel safe rapping off this guy. The right anchor is obviously wiggling its way out and with not much effort it moves significantly. Anchors on top of pitch two. You can see the right anchor is starting to come out and it does wiggle with not much effort. Scary to rap off! Umm. It isn't wiggling out. Looks the same as when I put it in. Unfortunately I started using glue ins after this route. But the 8" x 1/2" bolt hole was dug out a bit much when the hole was started. The edge of the hole will always be loose. That is a big problem here, the rock is weak and crumbles, so I used a longer than usual bolt. If it bothers anyone else, come talk to me and you and I can replace it. Otherwise, I'll check it again. Looks like they have loosened a bit. Definitely wasn't trying to complain, I just wanted to clear things up with a photo and my perspective on it. I would've absolutely gone back up and used some epoxy on it myself, but I was on a 3-day trip from Colorado and didn't see any of these 'warnings' until I got down off the climb to put my post up. I'm not quite sure what constitutes as loose, but I've never had an anchor wiggle on me like that. 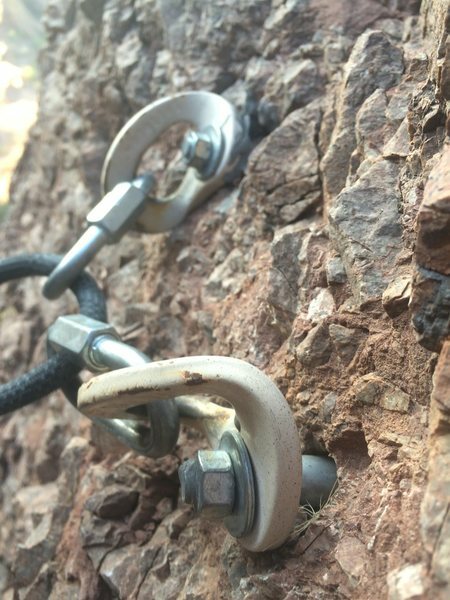 But then again this was my first time climbing in AZ and it's definitely clear the the rock at camelback is marginal. First pitch is eleven bolts. If youre absent minded like me and forget to check before going up and only have ten quick draws, there's a spot around 5 or 6 bolt where you traverse up and left over a hump, and the bolts are spaced close enough that once you get the next clip you can lean down and unclip the bolt below. I did this just to decrease rope drag over that hump, but was glad I did because I ended up needing it. Second pitch was 6 I think.